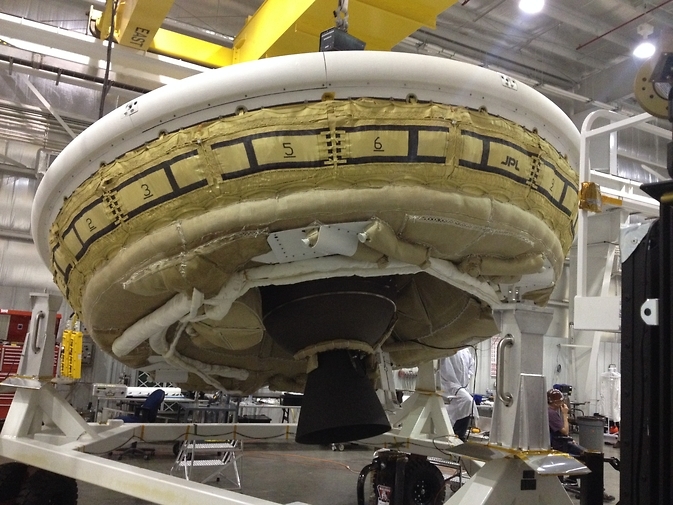 A saucer-shaped test vehicle holding equipment for landing large payloads on Mars is shown in the Missile Assembly Building at the US Navy’s Pacific Missile Range Facility in Kaua‘i, Hawaii. The vehicle, part of the Low-Density Supersonic Decelerator project, will test an inflatable decelerator and a parachute at high altitudes and speeds over the Pacific Missile Range this June. A balloon will lift the vehicle to high altitudes, where a rocket will take it even higher to the top of the stratosphere at several times the speed of sound. This image was taken during a “hang-angle” measurement, in which engineers set the vehicle’s rocket motor to the appropriate angle for the high-altitude test. The nozzle and the lower half of the Star-48 solid rocket motor are the dark objects seen in the middle of the image below the saucer.